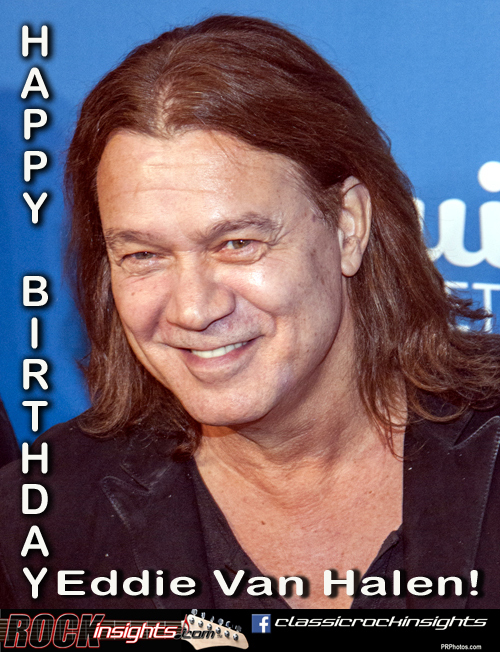 Edward Lodewiijk Van Halen rocked into this world on this date in 1955. The founding Van Halen guitarist was born in Amsterdam and given the middle name that is the Dutch version of Ludwig by his parents in homage to composer Ludwig van Beethoven. His father was a multi instrumentalist and got his sons started on piano when Eddie was just 6. When Eddie was 12, the family relocated to Pasadena, California where he took up drumming, but hearing brother Alex bang out the drum part of Wipe Out by the Surfaris convinced Eddie he couldn't top him so he switched to guitar. The two formed a grade school band called The Broken Combs and he and Alex were hooked. On 1/26/1986 Lynyrd Skynyrd's Allen Collins was paralyzed from the waist down and his girlfriend died in the crash of his new Thunderbird. On this day in 2014 Led Zeppelin finally earned its first Best Rock Album Grammy award for Celebration Day, the recording of the group's 2007 reunion concert. Paul McCartney and Ringo Starr reunited for the Ed Sullivan Show anniversary special in 2014. And Lindsey Buckingham did his last concert as a member of Fleetwood Mac at the MusiCares Person of the Year awards presentation. The group would oust him in early April.